Tickets are $25 per person which includes food. Bring out the playing cards, domino sets, bingo cards and whatever board games you fancy to have some fun. 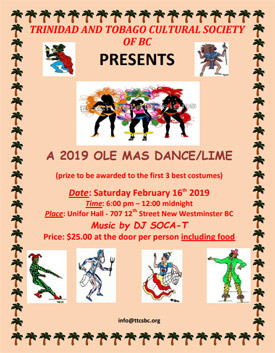 If you just want to dance well that’s not a problem, as popular DJ Soca-T will be spinning some great music to get you on the dance floor or tapping your feet while you play your games. Prize to be awarded to the first 3 best costumes! Get your tickets at the door! You can also call the TTCSBC office at (604) 515-2400 for more information.